What’s the ultimate goal of any billing experience? To get paid fast. Evaluate your current billing experience and then ask, does the experience provide tools that make it easy for our business customers to pay? That’s the secret to getting paid fast. The question applies to both on and offline payments. Although a large enterprise customer may not opt in for online or automatic payments, they can simplify review and approval with a good billing experience. Digital invoicing allows customers to consolidate any or all invoices, across multiple accounts, into a single invoice for payment. This requires a unique approach to how invoice data is mapped, loaded and stored – essentially allowing customers to bring together invoices of their choice on demand. This feature allows customers to align supplier invoices with their accounting and payment structures in just a few clicks. Self-service reporting and hierarchy management allow customers to match charge and usage data to their specific payment structures and policies. This requires a flexible reporting structure, as well as a depth and breadth of invoice data. Once these custom views and categorizations are created, customers can quickly validate charges as new invoices arrive – across all invoices and accounts or a subset. 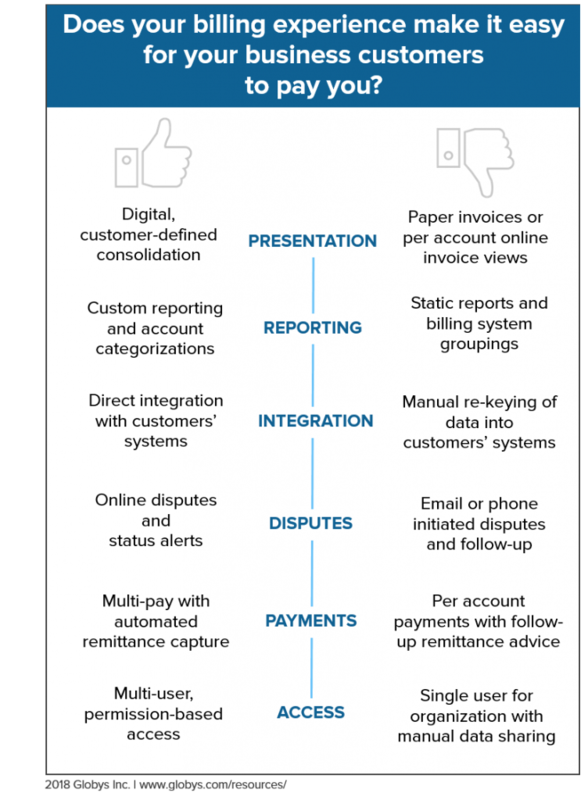 Whether a custom data feed or an automated transfer of invoices, these integration features allow suppliers to adapt their outputs to their customers’ payment processes, not vice versa. This direct integration provides an easy way for customers to input the suppliers’ digital invoicing data into their established systems and processes. This feature allows customers to raise disputes from within the context of a bill, at either the invoice or specific charge level. As the dispute resolution process ensues, customers are provided with in-app or email status updates. The amount of the dispute is automatically removed from the total outstanding due, allowing customers to move forward with the remainder of payment while resolution is determined. Multi-pay allows customers to submit a single payment for a group of consolidated invoices, while automatically capturing the required remittance information. This action can be completed online or set up for automatic payment each month. For larger business customers, who tend to pay offline due to more traditional payment policies, this same functionality is applied via a printed remittance slip. The customers’ payment process is far more complex than the final act of submitting payment, with several different roles and workflows involved. A multi-user application allows your customers to provide the right level of visibility and permissions to different roles throughout the organization. This includes access to specific accounts and services, self-service user management, and permissions for reporting and payment tasks. Online billing experiences are often promoted for their convenience factor – making it easy to access monthly invoices on demand. But an experience that is truly digital provides more value than just an easy way to view a static replica of the paper bill. Check out the Globys Suite to see how we make it easy for your customers to pay.